Tagliatelle and tagliolini (from the Italian tagliare, meaning "to cut") is a traditional type of pasta from the Emilia-Romagna and Marche, regions of Italy. Individual pieces of tagliatelle are long, flat ribbons that are similar in shape to fettuccine and are typically about 6.5 mm to 10 mm (0.25 to 0.375 inch) wide. Tagliatelle & tagliolini can be served with a variety of sauces. To learn how to make traditional tagliatelle & tagliolini, join our instructor, Modena native, Romina Montanari for a hands-on session. The class will be held at Mid-City Kitchen in St. Paul. 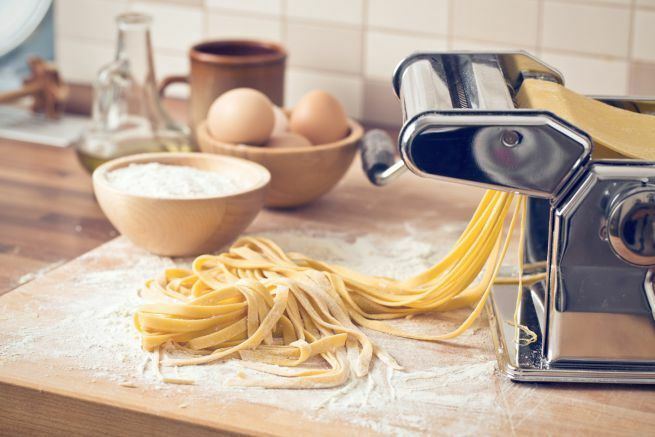 Romina will demonstrate and guide you through the process of making your very own tagliatelle & tagliolini! Each participant will sample the pasta in a light sauce and enjoy a glass of wine in a fun atmosphere. Everyone will take home the tagliatelle they just made. All ingredients are included, but please bring a large cookie sheet and two cloth kitchen towels to carry your tagliatelle & tagliolini home. The event is scheduled for Sunday, October 14th, 2:00 – 4:00 PM. The location is easy to find, conveniently located near the Green line of the light rail. If you choose to drive, free parking is available. Contact Tiziana at events@theitalianculturalcenter.org with your questions. As always, all events must be cancelled at least 72 hours in advance to receive a refund, less administrative costs.